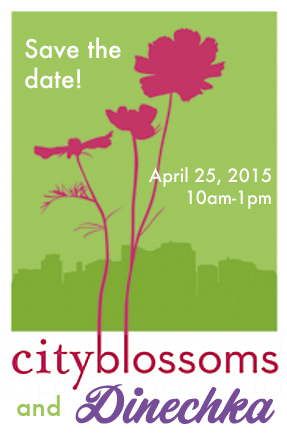 Thank you, everyone, for your participation in Saturday’s event with CityBlossoms! The turn out was amazing, we exceeded our fundraising goal, and we were able to set-up the entire gardening area at the Cardozo school. Receipts for charitable donations have been sent by mail, please do not hesitate to contact me if this has not been received. Hello everyone! It’s that time of year again! For this spring’s charity event, I have decided to team up with a local non-profit organization in DC called City Blossoms! City Blossoms works with community-based organizations, neighborhood groups, and schools to create outdoor spaces where children and youth can use their creativity, intellect, and energy to grow and maintain fantastic and functioning gardens. You can visit http://www.cityblossoms.org to learn more about this fabulous group. On Saturday, April 25, 2015 from 10am-1pm, we’ll be volunteering at Cardozo Education Campus Garden, located at 1200 Clifton St NW, Washington, DC 20009, to help prepare the gardens for a season full of delicious fruits and vegetables! Dress casually and be ready to get your hands dirty! Email me at: mail@dinechka.com or text 240-479-9745 to RSVP! Additionally, Middle School and High School students who volunteer can receive community service hours, so feel free to invite your younger siblings. If you cannot make it to the event, but still would like to contribute to the organization, you can click the button below to donate via paypal. All donations are tax deductible since City Blossoms is a 501(c)(3) organization. After the event, I will be posting the names of all our volunteers and donors to this blogpost. Thank you so much for your support and participating in helping our community!